A typical pencil is seen below. It has an hexagonal section (six sides) and as been sharpened exposing the lead/graphite, ready for use. The hexagonal shape has been selected for a very good reason. It allows the pencils to be stacked/ stored tightly together. 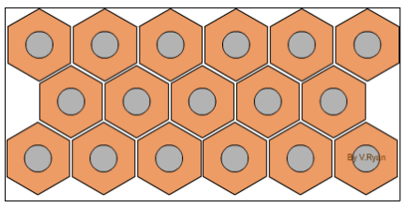 A hexagon is a very good example of a tessellation. A tessellation is a shape that is repeated over and over again without creating gaps or spaces. Tessellation is sometimes called ‘tiling’. The hexagonal pencils have been placed inside a rectangular box. This creates some empty spaces but the pencils can still be regarded as efficiently packed. 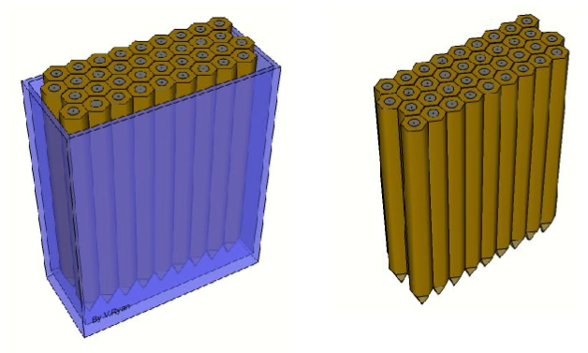 The 3D illustrations clearly show how the pencils have been arranged inside the box/package to reduce empty space. This shape has been chosen for the pencils so that they can be packaged and then transported efficiently. The shape ensures that packaging is kept to a minimum and that transport costs are also kept to a minimum.